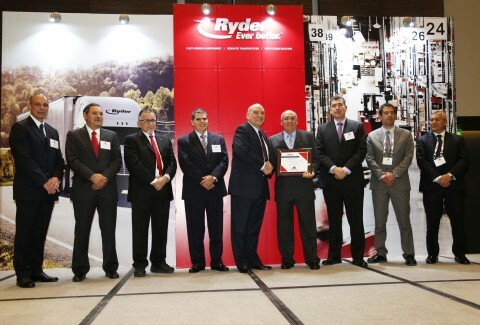 Ryder System, Inc. (NYSE:R), a leader in commercial fleet management, dedicated transportation, and supply chain solutions, presented its Service Excellence Awards to top-performing carriers at its eighth annual Mexican Carrier Recognition Event at the Hotel Westin Santa Fe in Mexico City. Twenty Mexican trucking companies were recognized for their excellence in several key performance areas, such as safety and security, on-time performance, customer service, and continuous improvement for the last full calendar year. "Ryder works with some of the best Mexican carriers in the country since we began our operations in Mexico in 1994 and the support that we receive from them has a direct impact on our ability to deliver on the promises to our customers across North America," said Gene Sevilla, Vice President of Ryder International Supply Chain Solutions. "Ryder is proud to partner with industry-leading Mexican carriers as their efficient operations support some of the most complex elements of our global supply chain solutions. We work with a wide range of carrier companies in Mexico and our annual recognition allows us to distinguish those carriers that have gone above and beyond to support Ryder and our customers with safe and timely deliveries." Large CarriersTransportes Monroy Schiavon, S.A. de C.V.Servicio de Transporte Internacional y Local, S.A. de C.V.
Midsize to Large CarriersAuto Express Oriente, S.A. de C.V.Transportes Pitic, S.A. de C.V.Corsa Transportes, S.A. de C.V.Autotransportes del Real, S. A. de C. V.Transportes Gasa, S.A de C.V.Express MG, S.A. de C.V.
Midsize CarriersDon Miguel Transportes, S. DE R.L. de C.V.Dynamo Fletes y Servicios, S.A. de C.V.Fletes Lozmar, S. A. de C. V.Servicios de Carga Transcar, S.A. de C.V.Oscar Eli Pérez PelaezServicios de Logística y Comercialización SEGA, S.A. de C.V.
Small to Midsize CarriersTransportes de Especialidades Químicas, S.A. de C.V.Junior Rodrigo Díaz GarcíaPromotora Norte Pacífico, S. A. de C. V.Alta Logística Flores Javier, S. DE R.L. de C.V.Tranmexco, S.A. DE C.V.Transportes Especializados TEMSA, S. A. de C. V.
Ryder provides comprehensive logistics and supply chain management solutions to companies with operations in the U.S., Canada, Mexico, and the U.K. In Mexico, Ryder contracts with more than 150 Mexican carriers. The Company also handles 214,800 cross-border freight movements between the U.S., Canada, and Mexico annually. Operating 207 facilities with 50 million square feet of warehouse space, Ryder offers flexible solutions as well as end-to-end visibility - no matter how challenging or diverse the storage and distribution needs may be. The Company, founded in 1933, operates behind the scenes, managing critical transportation and logistics functions for more than 50,000 customers, representing many of the world's best-known brands. Ryder employs 36,100 people and manages a fleet of 240,600 commercial vehicles. Ryder is a FORTUNE 500® commercial fleet management, dedicated transportation, and supply chain solutions company. Ryder's stock (NYSE:R) is a component of the Dow Jones Transportation Average and the S&P MidCap 400® index. Ryder has been named among FORTUNE's World's Most Admired Companies, and has been recognized for its industry-leading practices in third-party logistics, environmentally-friendly fleet and supply chain solutions, and world-class safety and security programs. The Company is a proud member of the American Red Cross Disaster Responder Program, supporting national and local disaster preparedness and response efforts. For more information, visit www.ryder.com, and follow us on our Online Newsroom and social media pages: Facebook, LinkedIn, Twitter, and YouTube.